The Perfect impression is the first step towards the preparation of a perfect prosthesis for the patient, so utmost care should be taken during Impression taking. which followed thoroughly will lead to a Good impression. 10. No tooth contact with the tray. By following these guidelines one can get an Ideal Impression. In the given Picture the impression is taken of a partially edentulous patient with the Anteriors missing. 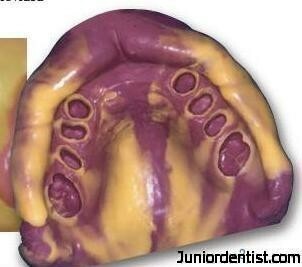 Your blog is quickly becoming my favorite for learning about the technical side of dentistry. Keep up the great content! why is agate spatula is named agate? That’s exellent. You ‘ve really made it easy.